The Year: 1999, October. I'd just been set up with this handsome Mathematician from Bell Labs and by all accounts hit off wonderfully (set-ups in the South Indian lingo is ALWAYS keeping the long term prognosis , i.e Marriage, in mind). So here I was like a typical Indian girl, taking the BIG step of inviting the guy home for Lunch. Ringing up a huge bill calling my mother back in India about what I should make. Given my mother's traditional roots, of course she suggested a South Indian Menu, keeping in mind 'HIS' preferences. 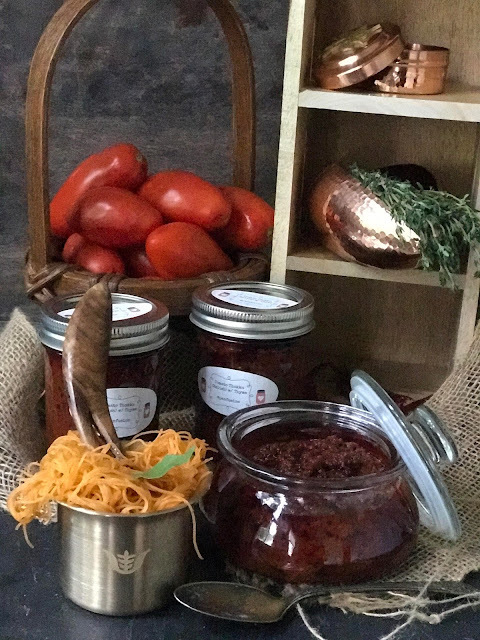 (once the girl gets hitched, her dietary preferences are tossed into permanent storage, its all about what the Son-in-law (or Son in law to be) likes). & in my true characteristic style, I ignored 1/2 of what she said. 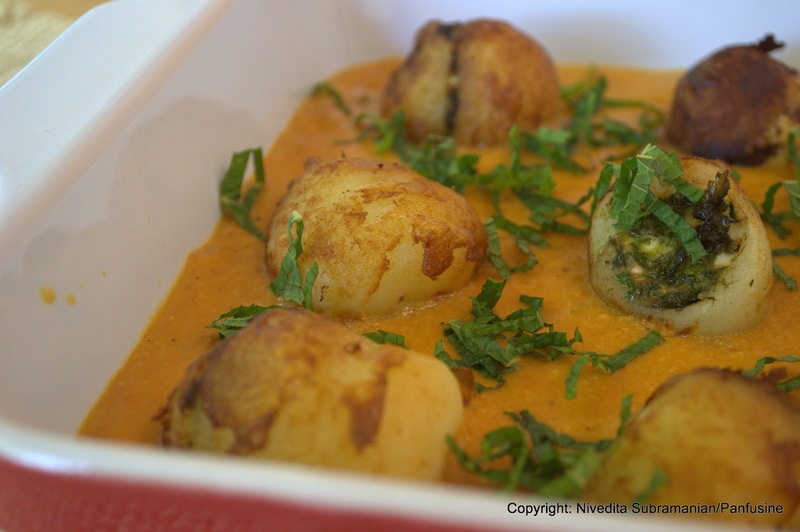 I set off to make a jumble of dishes that completely refused to complement each other, one of them being these amazing stuffed baby potatoes (minus the Feta cheese, since I don't believe I'd even tasted it then, leave alone being addicted) slow cooked in a cream sauce. He must have liked the food I cooked, even though he now complains that he lives on 'prototypes' (the 'loving' term he uses for my never ending stream of Panfusine recipe creations, Good, bad & the ugly) and has resigned himself to the fact that our 6 year old son has been converted into a die hard Foodie at such a tender age! Make a fine paste of the ginger, garlic and chile. set aside. Using the same blender /processor jar, make a fine paste of the Cashew nuts & onion, Set aside separately. Heat 2 tablespoons of butter / ghee in a skillet and add the crushed cardamom pods and the mace, swirl around until the spices begin to give out their aroma. Add the ginger/garlic/chile mix. Fry until the paste turns a golden brown. Next, add the Onion-Cashew paste and fry using the remaining ghee until the mix loses the aroma of raw onion. Add the crushed mint & turmeric and mix well. 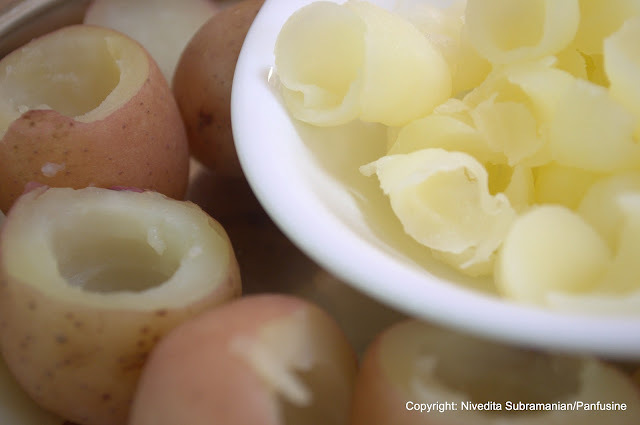 Parboil the potatoes in salted water until its possible to peel the skin, but they're still firm inside (use one of the potatoes as a guinea pig for testing the firmness). Mix the chickpea flour in a cup with as little water as required to make into a thick paste. (Season with some salt if desired). Cool the potatoes. 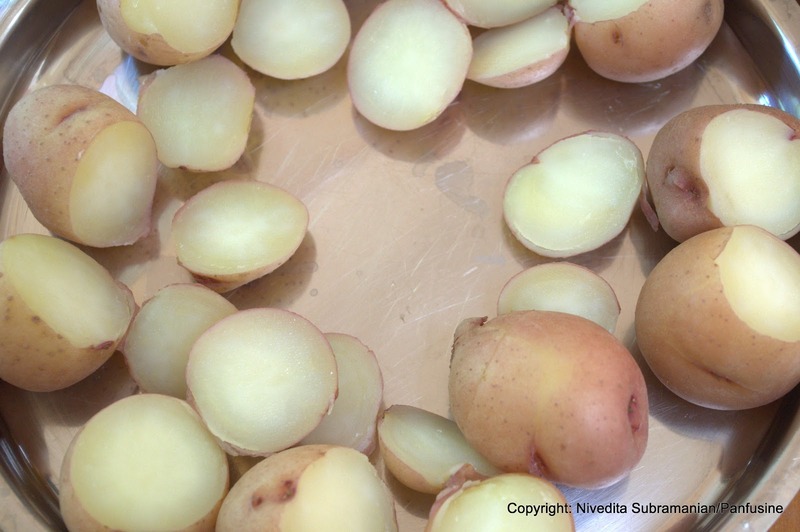 Without peeling them, slice off about 1 cm off the top of the potato. Reserve this 'lid' taking care to ensure that the lids are matched up with the rest of the tuber. Using a 'butter curler' or a melon baller, gently scoop out a hollow. Keeping the peel on helps in ensuring that the potato does not break. 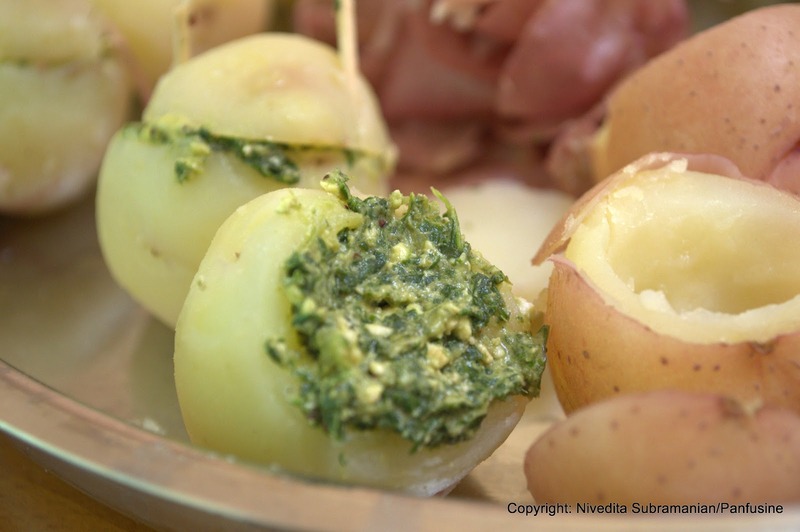 You may choose to peel the skin off after hollowing them or after filling the potatoes with the mint & feta mix. 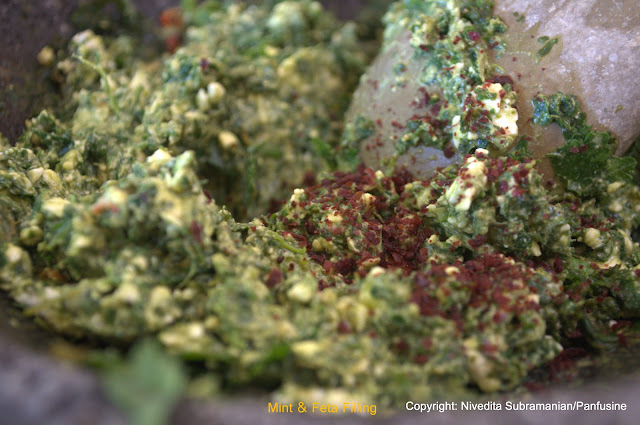 Combine the mint, cilantro, chile, lime juice, Sumac & Feta in the food processor and blend into a semi smooth paste. Fill the hollow with the mint feta mix. Brush the 'lids' with the chickpea paste and press on, securing the stuffed potato tight with 2 toothpicks. As an added precaution brush along the cut seam with some paste as well Do not leave out the chickpea paste step out.. (You'll have a row of little alien potatoes with toothpick antennae). Heat oil in a cast iron wok and deep fry the potatoes in batches until uniformly brown, Transfer onto kitchen towels to absorb excess oil and allow to cool completely. Once cool, gently remove the toothpicks and tally the count . 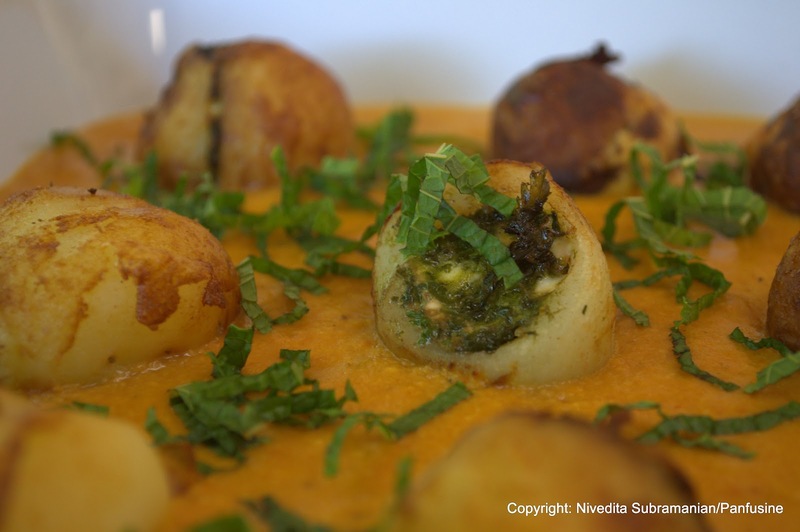 The Chickpea paste ensures that the potato remains in one piece. The lid will fall off otherwise. 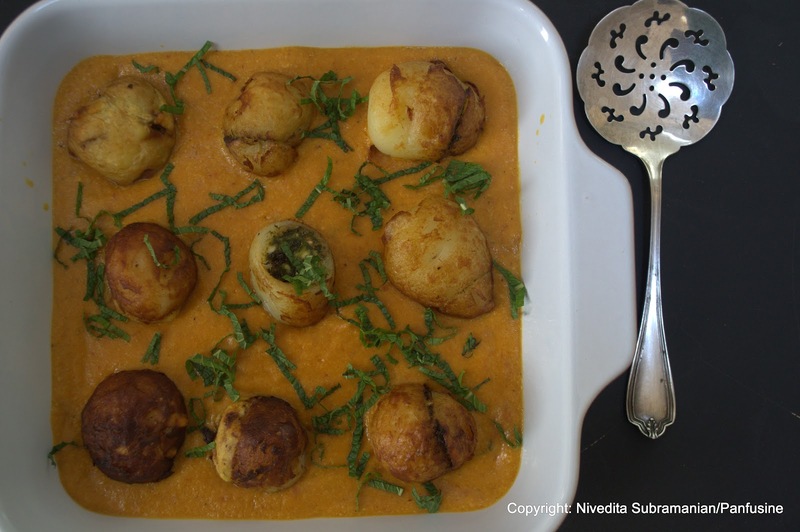 Heat the oven to 225 F. Place the potatoes in a ceramic square baking dish & pour the cashew sauce over. Cover completely with Aluminum foil crimping over the edges. Make slits for the steam to vent and pace in the oven to gently cook for about 1 hour. Garnish liberally with chopped mint prior to serving with rice, roti , lavash or any other flat bread. Great memories and great recipe too! May we hope for the rest of the recipes from that memorable day's lunch too? Little wonder your husband fell for you!! 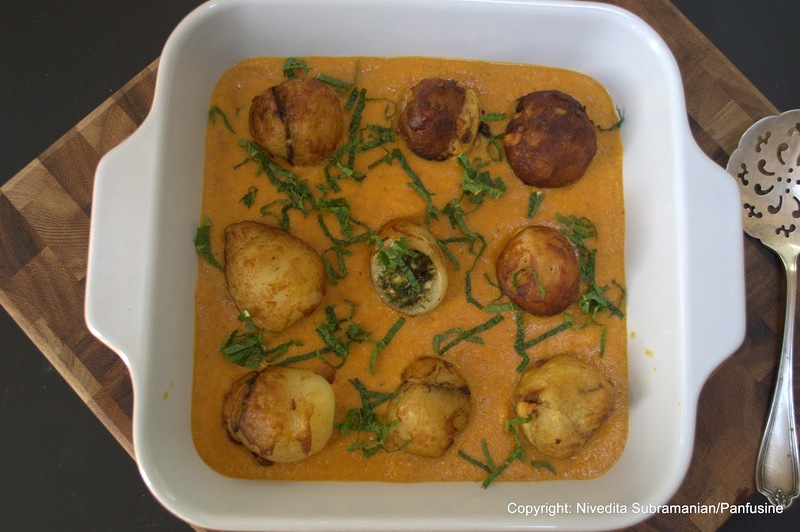 Thanks Rajani, The Kumquat cranberry rasam..Its been posted.. just not sure where.. Anything with potatoes and I'm sold! Nice story to these potatoes, too. I think I would probably eat the stuffed potatoes as soon as they're fried. They sound delicious even without the creamy sauce. Oh wow, Potatoes that get you hitched? I'm sure these would be good for getting new jobs, winning a million dollars (just present them to the game show host)...and a lot of other things! Thank you! !